​W.G. 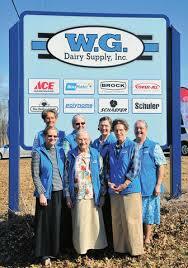 Dairy Supply, Inc. has a rich history dating back to 1964. Don Walder and Lloyd Gasser started W.G. Dairy Supply, Inc. to provide a service to the dairy farmers in Wayne county and the surrounding areas. Don then purchased Lloyd Gasser’s share soon after and owned the business with his wife, Martha Walder and later his 6 daughters (Sharon Rupp, Marian Stoller, Lois Gasser, Joanne Stoller, Arliss Pamer and Donna Gasser) until his death in 1998. W.G. Dairy Supply was initially opened in downtown Creston. As the company grew, a new facility was built in 1978 and the business continues to operate from that location. In 2010, a second location was opened in Minster, Ohio to better serve the western part of Ohio. Our customers are predominantly dairy producers, however we do try to reach the general public through our Ace Hardware retail store and livestock and grain producers with our complete line of feeding and grain handling equipment. Our success depends on the quality of our innovative product offering and the great people that make up our team at W.G. Dairy Supply, Inc. Our culture of honesty and integrity, coupled with our knowledge, professionalism and the ability to provide the best solutions to the customer, are the ingredients that will allow us to continue to improve at being a leader in Ohio’s Agriculture Industry.